93 year-old Lou Conter, who for the fifth year in a row made the trip to Honolulu from his Alta Sierra, California, home to remember his USS Arizona shipmates who died in the surprise air attack on Pearl Harbor on Dec. 7, 1941. Before the 73rd commemoration ceremony started on the Pearl Harbor Visitor Center’s main lawn on Sunday morning, Conter said that he and other survivors started gathering in Honolulu in 1991, and he now plans to come every year that he’s able. It’s not about him, he noted. “It’s to pay respects to the 2,400 who died that day, 1,177 on the Arizona,” the 93-year-old Conter said. 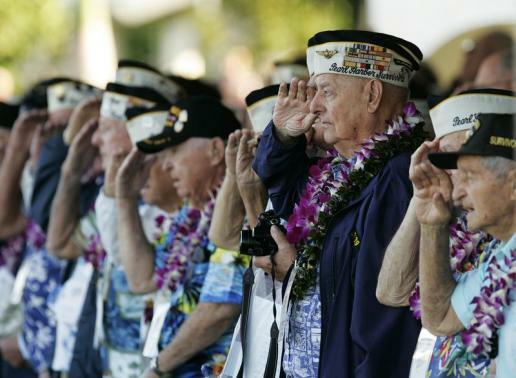 Seated next to him in the front row, fellow Pearl Harbor survivor John Mathrusse agreed. The 91-year-old had been near the Pacific Fleet on Ford Island when Japanese planes flew overhead and started dropping bombs that would claim 2,403 lives and mark the United States’ first battle of World War Two. As bombs rained down, Mathrusse said he was in survival mode. “I had a rifle, which I used,” he said, describing how he fired away at the planes. “It didn’t do any good but it sure made me feel better,” he added. Conter and Mathrusse were among more than 50 World War Two veterans who attended the ceremony, which drew about 2,500 guests – among them four of the nine remaining USS Arizona survivors who also attended the official gathering of the USS Arizona Reunion Association.